The male and female Nuthatch have a blue-grey back, rusty orange underside, long pointed bill and a distinctive black eye stripe. They are most often seen like woodpeckers clinging to the vertical trunks of trees or bird feeders. Common resident breeder in most of Europe except Iceland, North Scotland, N Scandinavia and Southern Spain. A bird of woodlands, parks and gardens with large mature trees. The Nuthatch is a regular visitor to bird feeders. 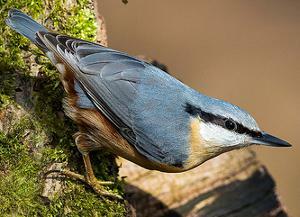 The Nuthatch can be a difficult bird to see in woodland and is most often seen at bird feeders. 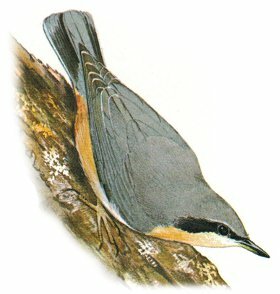 The Nuthatch is well adapted to feeding on vertical tree trunks and branches but will also feed on the woodland floor. Unlike the woodpecker the Nuthatch can feed facing down the tree due to it's large powerful feet, it does not rely on it's tail for support as do woodpeckers. The Nuthatch nests in holes in trees but readily uses nest boxes. Nuthatch feeding on tree trunk. Focuses on the Eurasian Nuthatch, with comparative information on the other west Palaearctic and world species. This extraordinary species is one of only a few to rely on stored food for winter survival and to live as a territorial pair. Note the distinctive posture, often feeding facing down on vertical tree trunks, the blue-grey back and bold eye stripe make the Nuthatch easily recognised.